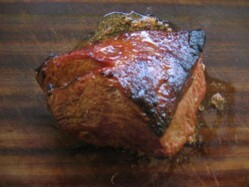 This barbeque roast beef recipe is really simple and all you need is a grill that’s set up for indirect BBQ cooking. If you’re not familiar with the phrase "indirect BBQ cooking" it means that the fire is not directly under the meat but to one side so in essence you’re cooking by convection like you would in a traditional oven. We're still going to cook at a high temperature like you would in the oven it's just that doing it over a fire gives us the opportunity to add some flavor with the addition of some wood chips to create smoke. This barbeque roast beef recipe is ideal for kamado ceramic BBQ grills because they retain the heat supremely well and you can run one at the desired temperature for a relatively long period of time without having to top up the charcoal. For indirect BBQ cooking on a kamado you need the heat deflector stone in position, this protects the meat from direct radiant heat and allows the heat to flow around the kamado by convection. That said you can also cook indirectly on a gas grill provided you have more than one gas burner on your barbecue. Use one burner to heat up the coals on one side of the grill and place your meat on the other with a drip tray underneath. For the smoke, place some soaked wood chips in a foil parcel, puncture the parcel and place it directly on your coals or onto the flavor bars of your grill. is fuel consumption because a gas grill won't retain the heat as well as a kamado. Make sure you start off with a good supply of gas. For this barbeque roast beef recipe, any good slab of roasting beef high in muscle content and low in connective tissue will do - I prefer sirloin. Avoid the tougher cuts such as chuck or brisket as these are better for the low and slow cooking process. Place the beef in a plastic bag and pour in ½ cup (100ml) of your marinade, seal the bag and refrigerate for as long as you have patience! A minimum of two or three hours is ideal and you can enhance the process by injecting marinade. Turn the beef occasionally. When the grill is ready, season the beef well with salt and pepper and cook just as if you were roasting. I like my beef rare so I’ll be going for 15 minutes per pound plus 15 minutes at 200°C or 400°F but you may want to do slightly longer depending on your preference. For the size of joint we're using the cooking time should be 65 minutes. Remember that if the outside is well cooked then it’s safe to eat. Serve with potatoes in creme fraiche, a green salad and perhaps some Cabernet Sauvignon in a large glass?